Despite the horrible cold weather there are occasional days when it feels like Spring might just be around the corner. After our failed trip to Kew Gardens earlier in the month, the lovely man and I went again, this time on a day when the sun actually shone and the orchids weren't completely rammed with people. It was still absolutely freezing and the orchids were still very busy, but wandered around the quieter, further reaches of the gardens and had a lovely morning. The magnolia buds were just starting to open. Some of the daffodils were trumpeting away in the brisk breeze. Long story short, don't bother going to the shop to buy trainers. They didn't have my size, or the colour I wanted. They suggested going to the Oxford Street flagship store....Which we duly trekked to, only to find that the guy there hadn't even heard of the style, and definitely didn't have any in stock. Sigh. I got home, went on the website and ordered my size in the blue colour I'd been eyeing up in the shop. And then a few other things because I was fed up and everyone needs more socks. Always. So I said goodbye to my Flyknit Lunar 2's and hello to my Flyknit Lunar 3's. 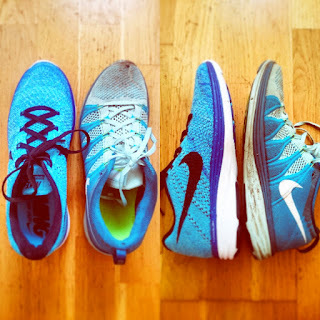 I thought my 2's had held up pretty well since I got them as my reward for my first halfmarathon in May 2014, but looking at them in comparison to the newer ones it was obvious that these were trainers that had earned their retirement. I'm not sure exactly how far they've done, but for context they carried through marathon training and to the finish line of my first marathon and beyond...and never once gave me blisters. Onwards and upwards now though, with some shiny new trainers for spring.